Mobile web or mobile app? The debate has raged for years. Now, there’s an emerging solution that takes advantage of the strengths of both to create a better experience: Progressive Web Apps (PWA). PWAs were introduced in 2015. Because they use less data than a regular mobile app, they first took off in emerging markets that suffer from poor internet connectivity. Now they’re taking off around the world. Hundreds of global marketers use them to create more seamless mobile user experiences. It’s not hard to see why leading brands would embrace PWAs. They realize the need to provide the best mobile experience for users―regardless of platform. PWAs eliminate friction by using the web to deliver app-level experiences. There’s no need for consumers to find apps in the app store and install them—they can just navigate to the site on any browser, including Chrome and Safari. PWA techniques focus on reliably loading faster (even working offline) and using less data. 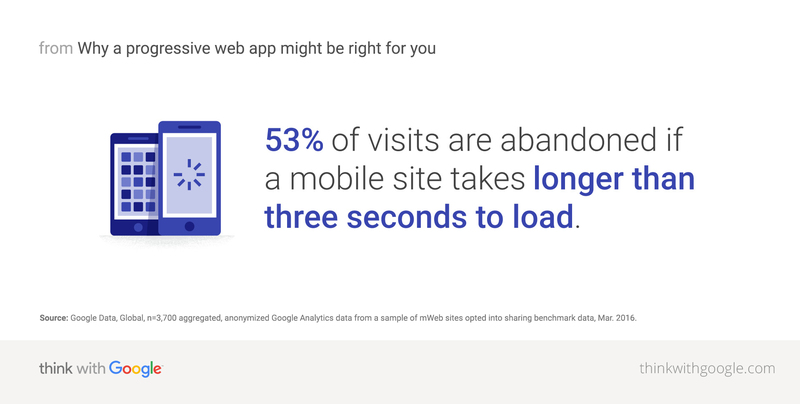 Given that 53% of mobile visits are abandoned if a site takes longer than three seconds to load, users abandon a mobile site if it takes more than three seconds to load [download], PWAs are a great option for marketers. Twitter is an early PWA success story. The company's PWA, Twitter Lite, takes up less than a megabyte, saves up to 70% on data, and loads 30% faster. First loads for Twitter Lite clock in at under five seconds over 3G networks on most devices, and subsequent loads are nearly instant, even on flaky networks. MakeMyTrip, a travel booking site in India, launched a PWA to offer all Indian smartphone users an effective and reliable mobile booking experience regardless of time, location, or network availability. The company saw overall conversion rate triple and a 160% increase in shopper sessions. “We have always said that addressing market needs is a key priority, and this launch takes us one step further in our commitment to providing mobility for a billion Indians,” said Ola Co-founder and CTO Ankit Bhati. Progressive web apps use less data than a regular mobile app. Results like that make it clear why PWAs are quickly becoming the new standard for web interactions. But this isn’t a matter of simply stripping out useful functions in favor of speed. PWAs, in fact, can be rich with features. On Android devices, users can be re-engaged with push notifications such as offers or reminders. They can also save PWA icons to their phone’s home screens, making them easily accessible. And PWAs don’t necessarily have to replace native apps; they can work in tandem with them. Retailers, for instance, can use a native app to engage loyal users who are more likely to install an app, but use a PWA to easily reach new users. Users who interact with the PWA can then be prompted to download the mobile app in the future. Alibaba.com, the world’s largest online business-to-business trading platform, saw a 76% rise in conversions and four times higher interaction rate after it upgraded its mobile site to a PWA. Beauty leader Lancôme saw a 53% increase in session length and its bounce rates have dropped by a full 10% amongst iPhone users. And it’s not just retailers. The Weather Channel saw an 80% improvement in site load time from its PWA, with almost one million users opting in to receive push notifications. Ready to start thinking about your own PWA? Talk to your development team about the best approach for your company. Here are a few tips to get you started. First, decide whether a PWA is right for your brand. PWAs are about providing users with the best web experience possible because it's where you likely have the broadest reach. Most users typically land on your website first. If you have a native app, you can prompt users to download it later to continue engaging with them. Next, consider the app install experience. PWAs allow a visitor to install the site as an icon on the home screen of her phone based on how frequently she visits your site. But be thoughtful about when to introduce the install prompt—it shouldn't feel intrusive to the user. Keep creative top of mind, including how the PWA looks when installed, the icon image, and the splash screen on launch. Another thing to keep in mind is the design of the PWA itself. Consumers have higher UI expectations for apps than for mobile sites so the interface should be responsive and designed for app-like interactions that are fast and seamless, even when internet connectivity is low. Finally, one of the best benefits of a PWA is the ability to send real-time alerts to engage users, even when the app isn't running. Push notifications are an incredibly powerful feature on the web and, when used thoughtfully, a feature that is often considered a best practice when it comes to mobile apps. Make sure your brand takes advantage.